In 1994, Dake et al first reported the use of thoracic "stent-grafts" for the treatment of descending thoracic aortic aneurysms (TAAs) in patients who were believed to be at excessive risk with conventional open surgery. They showed that placement of thoracic stent grafts, otherwise known as thoracic endovascular aortic repair (TEVAR), could be performed from a technical standpoint with relatively low morbidity; however, they noted that long-term follow-up would be required. The initial stent grafts were actually constructed by the implanting physicians themselves; later, the devices were restricted to those under investigational study. 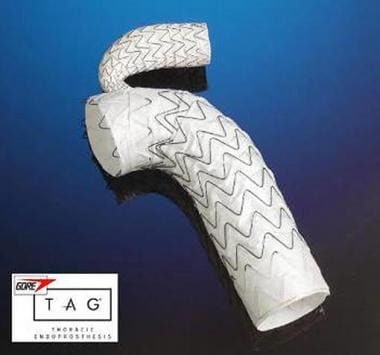 In 2005, the US Food and Drug Administration (FDA) approved the first commercially available thoracic stent graft, the W. L. Gore TAG endograft system (Flagstaff, AZ); in 2008, the FDA approved the Cook Zenith TX2 (Bloomington, IN)  and the Medtronic Talent (Santa Rosa, CA) thoracic endograft systems. All three of these devices were approved for use in the treatment of TAAs. The randomized clinical trial that led to the approval of the TAG device demonstrated that in patients with appropriate anatomy, TEVAR could be performed with lower operative mortality than open surgical repair (2.1% vs 11.7%) and with less spinal cord ischemia (3% vs 14%), respiratory insufficiency (4% vs 20%), and renal failure (1% vs 13%). However, TEVAR yielded more vascular access–related complications. Importantly, a small percentage of patients who were undergoing TEVAR did not have their aneurysms entirely excluded from the aortic circulation at 1- and 2-year follow-up. As in the 1994 study by Dake et al, the authors maintained that all patients undergoing TEVAR required close long-term follow-up. In this trial, the 30-day mortality was 5% (2/40); two more deaths occurred after 30 days, leading to a 1-year survival rate of 90%. The investigators noted aortic remodeling with a decrease in false lumen diameter and an increase in true lumen diameter, with complete thrombosis of the false lumen in 31% at 1 year. 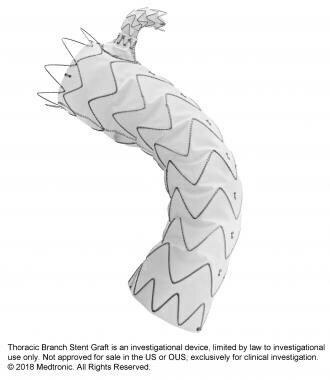 Additionally, trials are currently under way that are aimed at addressing thoracic aortic pathology encroaching on or involving the arch branch vessels, such as the Gore Thoracic Branch Endoprosthesis (Gore TBE) trial (see the first image below) and the Medtronic MonaLSA trial (see the second image below). Gore Thoracic Branch Endoprosthesis (Gore TBE). Courtesy of WL Gore & Associates, Inc (Investigational use only. Limited by US law to investigational use.). Medtronic Thoracic Branch Stent Graft. Courtesy of Medtronic (Investigational device; use is limited by law to clinical investigational use only. It is not approved for sale in the US or OUS.). Indeed in the authors' own experience at the University of Florida, a severalfold increase has been seen in TEVAR over open cases in the past few years (see the image below). The University of Florida/Shands Hospital's experience with open repair and Thoracic EndoVascular Aortic Repair (TEVAR) repair of thoracic aortic disease with a shift toward TEVAR. Over time, various smaller-profile TEVAR devices have been investigated through trials. At present, the Cook Alpha is the smallest-profile device that may be considered in patients with small iliac arteries. The Medtronic Navion is another lower-profile TEVAR device that has been approved by the FDA. 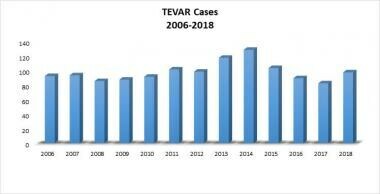 TEVAR has been around for two decades and has come to be established as first-line treatment for most descending thoracic aortic pathology, aneurysms, dissections, and penetrating aortic ulcers, yielding a significant reduction in morbidity and mortality as compared with open surgical repair. Improved materials, reduced delivery sheath sizes, enhanced conformability, the development of tapered grafts, and the availability of a wider range of sizes have all improved the applicability of TEVAR and the outcomes of the procedure over this initial decade of widespread use. The official FDA-approved "on-label" indication for the stent grafts currently available commerciall yin the United States (W. L. Gore C-TAG, Cook Alpha, Medtronic Valiant, Navion, and Bolton Relay) is for treatment of descending TAAs with a diameter at least two times greater than that of the adjacent aorta. Furthermore, there must be sufficient aorta (typically 2 cm) of normal dimensions on either side of the aneurysm (the so-called proximal and distal landing zones) to allow the stent graft to adhere (seal) to the aortic walls and achieve exclusion of the aneurysm. TEVAR is increasingly being considered the optimal treatment of complicated descending thoracic aortic dissections in preference to open surgery. [4, 5] Clinical experience over time, the ongoing evolution of endovascular devices, and several multicenter trials have led to FDA approval of Medtronic and Gore thoracic stent graft devices for use in patients with acute and chronic dissection. In the United States, the Zenith TX-D endograft system (Cook, Bloomington, IN), as of January 2019, is in the process of seeking approval for use in complicated dissection. Patients with connective tissue disorders in whom a high likelihood exists of further tissue degeneration (eg, those with Marfan disease) were specifically excluded from the trials that led to FDA approval of the devices available in the United States (Cook Alpha, C-TAG, Medtronic Valiant, Bolton Relay). Dake MD, Miller DC, Semba CP, Mitchell RS, Walker PJ, Liddell RP. Transluminal placement of endovascular stent-grafts for the treatment of descending thoracic aortic aneurysms. N Engl J Med. 1994 Dec 29. 331 (26):1729-34. [Medline]. Torsello GF, Torsello GB, Austermann M. Zenith TX2LowProfile TAA Endovascular Graft: a next generation thoracic stent-graft. J Cardiovasc Surg (Torino). 2012 Apr. 53 (2):153-9. [Medline]. Buth J, Harris PL, Hobo R, van Eps R, Cuypers P, Duijm L, et al. Neurologic complications associated with endovascular repair of thoracic aortic pathology: Incidence and risk factors. a study from the European Collaborators on Stent/Graft Techniques for Aortic Aneurysm Repair (EUROSTAR) registry. J Vasc Surg. 2007 Dec. 46 (6):1103-1110; discussion 1110-1. [Medline]. [Full Text]. Trimarchi S, Nienaber CA, Rampoldi V, Myrmel T, Suzuki T, Bossone E, et al. Role and results of surgery in acute type B aortic dissection: insights from the International Registry of Acute Aortic Dissection (IRAD). Circulation. 2006 Jul 4. 114 (1 Suppl):I357-64. [Medline]. Svensson LG, Kouchoukos NT, Miller DC, et al, Society of Thoracic Surgeons Endovascular Surgery Task Force. Expert consensus document on the treatment of descending thoracic aortic disease using endovascular stent-grafts. Ann Thorac Surg. 2008 Jan. 85 (1 Suppl):S1-41. [Medline]. Nienaber CA, Kische S, Rousseau H, Eggebrecht H, Rehders TC, Kundt G, et al. Endovascular repair of type B aortic dissection: long-term results of the randomized investigation of stent grafts in aortic dissection trial. Circ Cardiovasc Interv. 2013 Aug. 6 (4):407-16. [Medline]. Mikhail P, Hess PJ Jr, Klodell CT, Beaver TM, Lee A, Tribble CG, et al. Closure of type I endoleaks and landing zone preparation of the thoracic aorta. Ann Thorac Surg. 2008 Feb. 85 (2):e9-11. [Medline]. Patel PJ, Grande W, Hieb RA. Endovascular management of acute aortic syndromes. Semin Intervent Radiol. 2011 Mar. 28 (1):10-23. [Medline]. [Full Text]. Kolbeck KJ, Kaufman JA. Endovascular stent grafts in urgent blunt and penetrating thoracic aortic trauma. Semin Intervent Radiol. 2011 Mar. 28 (1):98-106. [Medline]. [Full Text]. Tang GL, Tehrani HY, Usman A, Katariya K, Otero C, Perez E, et al. Reduced mortality, paraplegia, and stroke with stent graft repair of blunt aortic transections: a modern meta-analysis. J Vasc Surg. 2008 Mar. 47 (3):671-5. [Medline]. Seabrook GR. Current Procedural Terminology (CPT) coding for descending thoracic aorta endovascular repair. J Vasc Surg. 2006 Feb. 43 Suppl A:106A-110A. [Medline]. Scali ST, Kim M, Kubilis P, Feezor RJ, Giles KA, Miller B, et al. Implementation of a bundled protocol significantly reduces risk of spinal cord ischemia after branched or fenestrated endovascular aortic repair. J Vasc Surg. 2018 Feb. 67 (2):409-423.e4. [Medline]. Findeiss LK, Cody ME. Endovascular repair of thoracic aortic aneurysms. Semin Intervent Radiol. 2011 Mar. 28 (1):107-17. [Medline]. [Full Text]. Three-dimensional CT reconstruction of thoracic aorta with aneurysm in the arch aorta. Retroperitoneal incision to access the right common iliac artery. Dacron conduit attached to the right common iliac artery brought out below through a separate incision. Automated contrast injection system attached to the 5F pigtail catheter inserted via the left common femoral artery. Baseline aortogram showing arch anatomy. Predeployment angiogram showing the endograft in the arch aorta. Angiogram performed following endograft deployment. Coil embolization of left subclavian artery to prevent endoleak. The authors use the Artis zee system (Siemens Medical Solutions USA, Inc) in their hybrid operating room. Courtesy of Mark Herboth Photography, LLC, for the University of Florida.